Have you ever wondered why you existed? Have you ever wondered why you are experiencing a particular situation in your life? Maybe you are battling with sickness in your body or you have a child that has poor health. I remember asking the Lord this question twenty years ago when I just gave birth to an infant who had a terrible congenital heart disease. Nobody in my family had heart disease and all of my siblings had healthy children. So, of course I could not understand why I was the only one who had a sick child. Do you know what the Lord said to me? He told me that He trusted me to raise and take care of His child. I have been doing that for over twenty years. Thank you, Lord, for having confidence in me. I cannot afford to let you down! I shared my story to let you know that the reason why you are going through a tough period in your life is because the Lord has confidence in you that you will endure and come out victorious. 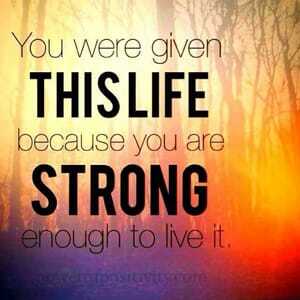 As a matter of fact, the reason why you exist in the land of the living is because God knows that you are strong. You may not think that you are not strong enough to endure, but that is okay. It is in your weakness that God’s strength prevails in you. Don’t give up because like the three Hebrew boys, you will come out of the fire 🔥 without a singe or the smell of smoke (Daniel 3). Amen! Thank you for sharing. Timely. You are welcome. Be blessed. I was just reading your testimony about your son from your book to my husband this morning, Beverley. God is so faithful and was watching out for you and your son while you were enduring this time in your lives. It really gripped me when I read what he had gone through and your desperation with the news from the doctor and finally releasing and surrendering him into Gods hands, placing your confidence in Him with the outcome of his recovery. A truly remarkable story. Thank you for this message. It was indeed a trying time and my strength was in God. I am grateful to God that my testimony is a blessing to you and others. God bless you for reading and sharing. Amen-Amein!! Hallelujah and Maranatha EVERYONE! !